Real-time Service Area for Security Tech Inc.
Professional. Honest. Delivered on what was promised. Followed up when needed. Overall great experience! Everything went well. Employee showed up on time and repaired bad contact. 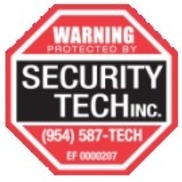 From beginning to end, Security Tech Inc understood what I needed and even recommended better equipment to give me the peace of mind for me and my family. This is our new home and I know it’s protected thanks to Gene and his team! From the bidding to the installation it was smooth sailing. Gene was on top of the work being done, his men were knowledgeable, courteous, and very clean. Will definitely call for all future needs. Best Alarm company in town. You need not call anyone else but Security Tech. They are awesome and great prices too! Great to do business with a PRO! I have been doing business with Gene and Security Tech for about 20 years. EXTREMELY reliable. Personalized service by knowledgable technicians. Providing Video & Alarm Systems for new We Florida Financial Federal Credit Union in Lauderhill. Quoting Commercial Alarm & Video System for Compass Investigations in Pompano Beach.